Kohler Ceiling Mounted Bathtub Filler | OhGizmo! There are a lot of things you never realise you need until you see them. For me this isn’t one of them though I will admit that in person this probably looks pretty cool. From bathroom innovators Kohler comes this ceiling mounted bathtub filler. 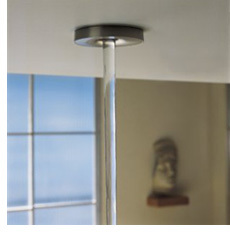 While this faucet can also be mounted on a wall, installing it on the ceiling is what will get people talking… I guess. I assume this bathtub filler uses some sort of filtering system to smooth out the flow of the water as it leaves the faucet to ensure that splash back when the stream hits the bathtub is minimal. The Kohler website lists this faucet for $383.70 and up so I can assume the ceiling mounted version falls on the ‘and up’ side. And keep in mind since most bathrooms do not have water pipes running over the top of the bathtub installation will most likely fall on the ‘and up’ side as well. The only problem is efficiency. Heat loss will prove annoying after a while. It’s amazing how much entropy will occur in the distance from the ceiling to the floor.